Ross Halleck founded the marketing agency, Halleck Design Group, in 1980 to assist the Silicon Valley technology industry and the Northern California wine industry (Iron Horse, Beaulieu, St. Supery). Bitten by the wine bug, he moved to Sonoma County in 1991 with his wife Jennifer and three sons. Buoyed by his wife Jennifer’s experience in the wine industry, and their shared passion for wine, they have together rapidly become one of Sonoma’s most high-profile producers of ultra premium Pinot Noir. The Hallecks planted their family estate Pinot Noir vineyard in 1993 with the intention of setting aside profits from this vineyard for their three sons’ college educations. Overlooking the Russian River Valley in the Sonoma Coast, this 1-acre vineyard was planted to clones 115, 667 and 777. The first harvest was 1999. The Hallecks expanded their Pinot Noir offerings by sourcing fruit from other excellent vineyards in the Sebastopol area. They now produce three vineyard designate Pinot Noirs and a Pinot Noir blend from three vineyards called Three Sons Cuvée. Jennifer spent some time working at Tandem Winery with winemaker Greg LaFollette who was Halleck Vineyard’s first winemaker. Greg’s protégé, Rick Davis (Londer, Cal Star, Alcina), is the current winemaker. He has continued to instruct Jennifer in the art of making fine wine and ultimately Jennifer hopes to take over some of the winemaking chores. Currently the wines are vinified at Owl Ridge Wine Services in Sebastopol. 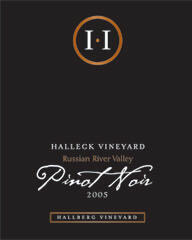 Winemaking is similar for each of the Halleck Pinot Noirs with changes instituted as each wine dictates. A 5-day cold soak is followed by whole berry fermentation in steel open top 5 ton fermenters or t-bins if the lot is small and punched down twice a day. A portion of whole clusters is included if ripeness of the stems allows their use. The barrel program is 30% new French oak, 30% 1- year old barrels, and 40% neutral barrels. Multiple French coopers are used, but inclination is toward Allier forest. After four months in barrel, the wines are tasted and the final blends determined. A decision is made about what oak treatment each blend needs in barrel for another 5-6 months and the wines are returned to appropriate barrels. 14.1% alc., 750 cases, $38. This wine is sourced from The Farm Vineyard, Hallberg Vineyard and Hawk’s Roost Vineyard. Clones are Dijon 115,777. · The aromatics are enticing with notes of cherry and toast and a kiss of anise. Light to medium weighted, this wine has a well-constructed Bing cherry core of fruit all wrapped in a satin-sheet-like texture. There are some cola highlights also - more Pepsi than Coke. With laser-like clarity and balance, this Pinot is flat-out terrific. 13.9% alc., 140 cases, $55. Clones 115 and 777. · Now this is what I’m talking about! An intriguing nose of crushed black cherry and mahogany wood shed leads to succulent red cherry and red currant flavors which take on darker tones with time in the glass. The fruit is pure and perfectly ripe. The finish is crisp and luscious with a raspberry kiss that persists an eternity. So sublime, I wanted to drink the whole bottle. 14.8% alc., 270 cases, $55. This 2-acre vineyard is in the neighborhood of the Halleck Vineyard and is managed by Jim Pratt. It was planted to Dijon clone 777 in 1999. In previous years wine from this vineyard was blended into the Three Sons Cuvée. · Befitting the source, there is some farm yard in the nose with a little funk and a touch of alcohol. There is noticeable sweetness of deep red fruits with an appealing earthiness. The finishing note is complex with pomegranate, hay, game and wood notes. The tannins are well-concealed. Patty really liked this wine, but I found it too much of an earth child. 13.4% alc., 100 cases, $75. · The aromatics and flavors are quite disparate. Plenty of oak toast and barnyard influence in the nose. The flavors are red-fruit driven with generous spirited cherry notes and a hint of oak and herbs on the clean and brisk back end. The wine has an appealing lightness about it , meaning it is easy and satisfying to drink without any hard edges. Halleck Vineyard wines are sold primarily to mailing list members through the website, www.halleckvineyard.com. There is some restaurant and retail distribution. The Hallecks offer a number of special events including trips abroad to members of their Estate Wine Club. Subscribe to the frequent e-mail newsletter. Currently they are offering a bottle of the Three Sons Cuvée housed in a silk-lined gift box including a gift card for $48. Halleck Vineyard also produces a Sauvignon Blanc and a Dry Gewurztraminer (the 2006 was just released in time for Thanksgiving). There was no 2005 Estate Pinot Noir produced, but the 2006 is currently resting in barrels. Halleck Vineyard is located at 3785 Burnside Road, Sebastopol. 707-738-8383. Tasting by appointment. 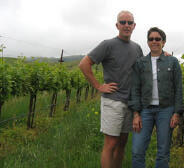 Jonathan and Susan Pey are winegrowers and residents of Marin County who have a shared passion for wine. Jonathan has had a career in the ultra-premium wine industry at Domaine Louis Jadot, Penfolds, and Robert Mondavi Vineyards. Susan is a wine buyer for a large prestigious restaurant group in the Bay Area. Together they launched their own line of wines in 1999 and today produce Pinot Noir and Riesling under the Pey-Marin label, Merlot and Vin Gris under the Mount Tamalpais label, a Cabernet Sauvignon from Oakville in Napa Valley labeled Textbook and a Paso Robles Syrah called Spicerack. Their umbrella company is Scenic Root Winegrowers. To be honest, growing Pinot Noir in Marin County is not for the faint at heart. The few vineyards hold much potential when the weather cooperates, but small, even miniscule yields, are often the rule. Jonathan calls the yields “stupid - pick a low number!” The soils are decomposed marine sediment and drain beautifully. Located only 8 miles inland from the Pacific Ocean, the region is quite cool and the resulting growing season is extended in length. Typically, the Pinot Noir clusters and berries are tiny, with high skin to juice ratios. 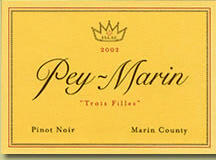 I have enjoyed several vintages of Pey-Marin Trois Filles Pinot Noir (named after the Pey’s three daughters). Jonathan leases and farms part of three vineyards in Marin County: Pey-Marin block (Pommard, Swan and 115) at Corda Vineyard, a block at Stubbs Vineyard (115), and a block at Kendric Vineyard (Pommard, 667, 777). The three sites are quite diverse with differing slopes, orientation, clones, rootstocks, age, location and harvest dates. Pey-Marin and Stubbs are organically farmed, Kendric is (very) sustainably farmed. Pey-Marin is 17 years old, Stubbs is 10 and Kendric 8. I asked Jonathan about his winemaking regimen. Fruit is hand harvested and hand sorted at the winery. The grapes are completely destemmed and crushed, but the crusher element is removed from the destemmer to get a lot of whole berries for some carbonic fermentation. Usually the grapes are harvested at 24.5° to 25.5° maximum Brix. The grapes are chilled and punched down by hand twice a day for four days during fermentation and then let go to “do their own thing - kind of like Burgundy.” Natural fermentation starts on its own to add some nice funk, but Jonathan always adds a cultured yeast to make certain fermentation finishes full. At 5-8° Brix he presses off to allow a modest barrel ferment to happen in new French oak barrels (Jonathan learned this from his friend Peter Gago at Penfolds who does it for his better lots for a wine called Grange). No racking or fining, but lots of batonage in barrel for about 14 months. Barrels are about 35% new, all top coopers. He adds a small touch (3-5%) of vintage 2006 juice to give it a nice fruit lift just before bottling. The wine is gently filtered with a very modern cross flow filter. He ages it in bottles 6 months before release. 13.8 % alc, 320 cases, $39. According to Jonathan, his best yet, “combining great coolclimate Pinot typicity with some nice earthy (dare I say terroir) tones, wrapped with a kiss of new French oak.” · A lot of winemakers say every current vintage is their best yet, but this really is true here. Exciting scents of snappy cherry and oak spice lead off. A sweet-fruited palate of black cherries and black raspberries with a hint of cool minerality follows in step. A crisp and juicy Pinot Noir with impeccable balance. Nice finesse but not wimpy! A thoroughly enjoyable, mouth-filling wine that is brilliantly crafted. Kudos! 14.1% alc., 372 cases, $36. Clones 115, 667, 777. · Perfume of very ripe dark berries, raisins, oak and cardamom spice carries through to the finish. Velvety in texture with weighty tannins on the moderately lengthy finish. A decent Pinot but can’t compete with the other vintages for attention. 13.8% alc., 269 cases, $33. Clones 115 and 667. Very low yields. · Attractive dark cherry and berry aromas highlighted with earth and oak. Lovely dark cherry and cassis flavors with a sidecar of smoke and oak. Texturally smooth with brisk acidity and felty tannins on the finish. Drinking beautifully now. 13.5% alc., $29 · The fruit has faded a tad but all kinds of other interesting components have come out to play. Still pumping out terrific aromatics of blackberries, oak, cigar box and a hint of mint. Earthy, shroom flavors. A lot of fun after five years. Pey-Marin wines can be purchased on the website at www.marinwines.com. The other varietals, particularly The Shell Mound Riesling are worthy of attention. Sign up for the mailing list to receive advance notice of releases. 415-455-WINE. No tours or tasting. Buena Vista Carneros celebrated its 150th Anniversary last September 7, kicking off “California Wine Month.” Buena Vista was California’s first premium winery and was founded in 1857 by Hungarian Count Agoston Haraszthy (left). Haraszthy was an eccentric character and a bon vivant immigrant who developed an extensive resume of accomplishments in this country before finally ending up in Sonoma Valley. He founded the town of Sauk City, Wisconsin, was the first federal marshal and state representative of San Diego, and authored a book, Travels of North America which led to the immigration of thousands of Europeans to the United States. His dream was to plant wine grapes and produce wines that one day would rival those of the Old World. In March of this year, Haraszthy was awarded the posthumous honor of being one of the very first inductees into the Culinary Institute of America’s Hall of Fame. 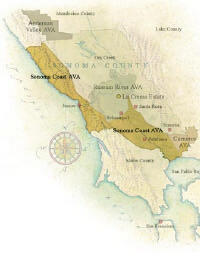 Today, Buena Vista Carneros is a very large landowner in the Carneros appellation with 1,000 acres of vineyards. The focus is on the Ramal Vineyard, which has been replanted and revitalized in recent years. Replanting of all estate vineyards will be completed in 2010. Primarily Chardonnay, Merlot, Syrah and Pinot Noir are grown here. The Ramal Vineyard and winery are in Sonoma Carneros and the original historic winery housing the tasting room is located just off the plaza in the town of Sonoma. Under the guidance of winemaker Jeff Stewart and viticulturist Craig Weaver, and with a large infusion of capital from owner Beam Wine Estates, Inc., the winery has recently taken serious steps to reduce output and improve the quality of its wines. The recent releases have been quite stunning. 13.5% alc., 25,295 cases, $23. Winemaker Jeff Stewart can draw from a dozen clones among 40 individual blocks. · This is a delightful cherry-driven wine with a nice touch of spice. Elegant and harmonious with a crisp and fruity finish, this is a terrific wine for the price. This wine is not a Big Boy, but structured for easy drinking with and without food. Many Pinot Noirs at this price point just don’t deliver the goods, but this one hits all the right notes. Buena Vista Carneros wines have widespread retail distribution and may be purchased on the website, www.buenavistacarneros.com. Three other Pinot Noirs are produced in the Estate Vineyard Series (EVS): 2005 Ramal Vineyard Pinot Noir, 2005 Ramal Vineyard Clone 5 Pommard Pinot Noir and 2005 Ramal Vineyard Clone 828 Pinot Noir (all $42). Tasting room: 800-926-1266. Mike Bohan was the first modern winegrower to farm grapes in the true Sonoma Coast region of California in 1973. He planted Zinfandel, Chardonnay, Pinot Noir and Riesling on Bohan-Dillon Road in the remote town of Cazadero. To this day, he sells all of his grapes. David Hirsch, an expatriate from the Bronx, purchased 1,100 acres on a remote ridge 900 feet above the Pacific Ocean at the end of Bohan-Dillon Road. He had originally planned to reforest the area with redwoods which had been decimated by loggers. Only after a friend advised him to plant grapes, did he begin to develop a 47- acre Pinot Noir vineyard in 1980. The weather here is quite cool, but Hirsch planted his vines above the fog line where they enjoyed plenty of sunshine. 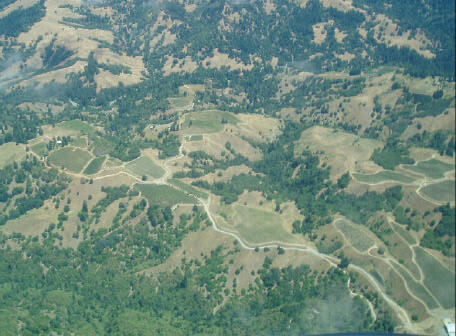 The vineyards are actually scattered over several ridge tops with varying exposure, altitude and soil type. 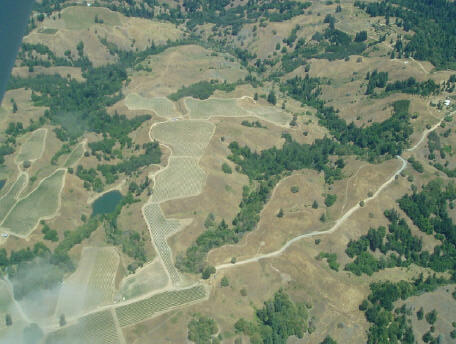 With a variety of rootstocks and clones planted, there is considerable heterogeneity to the fruit and Hirsch Vineyard Pinot Noirs from different producers are difficult to compare as they come from distinctly different terroirs (see air photo below). Over the years, Hirsch has supplied fruit for single-vineyard Pinots Noirs from many of California’s top producers including Failla Jordan, Harrington, Kistler, Kosuge, Littorai, Siduri, Walter Hansel, William Selyem, Whitethorn, and even Oregon (Patricia Green). In 2001, the Williams Selyem contract for some of the finest blocks expired (originally obtained by Burt Williams), and David Hirsch decided to bottle his own label. He built a winery on the property in part of an old lambing barn and hired Vanessa Wong (Peay Vineyards), a star among Sonoma Coast winemakers, as his vintner. The initial release was the 2002 vintage. This same year a small amount of Hirsch Bohan-Dillon Pinot Noir was produced as primarily a “family and friends” wine from barrels that did not make the grade for the vineyard-designate label. It was named in honor of the single access road which leads to Hirsch Vineyard (see below). No Bohan-Dillon Pinot Noir was produced in 2004 and 2005 due to poor crop yields. With the bounty of the 2006 harvest, 220 barrels of Bohan-Dillon Pinot Noir and 12 barrels of Bohan-Dillon Chardonnay were produced under the direction of current winemaker at Hirsch, Mark Doherty. 14.6% alc., $30. · A simple Pinot Noir that makes a pleasant overall impression. Earth, damp leaf and spiced cherry scents with red Pinot fruit flavors enhanced by tones of herbs and oak. Light in the mouth with a good acid kick on the backend. Hirsch Vineyard and Bohan-Dillon Pinot Noirs are sold primarily through a mailing list available at www.hirschvineyards.homestead.com. There is some retail distribution. The current release of Hirsch Vineyard Pinot Noir is the 2005 vintage. This was a vintage from hell with 30 inches of spring rains destroying much of the crop during bloom, reducing yields to one half ton per acre. Hirsch notes, “There were so few berries that the bunches looked like leprous cadavers. It was so gruesome, that I often became physically ill upon entering the vineyard and beat a hasty retreat.” Fruit from adjacent Hellenthal Vineyard and nearby McDougal Vineyard were added to supplement the Hirsch fruit and a total of 960 cases was produced. 26 new acres of Pinot Noir have been planted which will significantly increase production in 2007. 2005 marks the first vintage of Hirsch Vineyard Chardonnay (8 cases, but will increase in the future). Hirsch has decided to make his Chardonnay using glass-lined fermentation tanks rather than oak. 45075 Bohan-Dillon Rd, Cazadero, CA. 707-847-3600. Tours and tasting by appointment (plan on a full day if driving from more populated areas of Sonoma and try to time your visit when it isn’t raining - Cazadero receives 80 inches of the wet stuff each year). Every true pinotphile should make the pilgrimage some time in their life. 13.9% alc., 964 cases, $24, screw cap. This wine is named after the owner’s daughter’s nickname. It is a blended from several top vineyards in several appellations including Ribbon Ridge, Dundee Hills, Yamhill-Carlton, McMinnville and Eola-Amity Hills. · The nose is quite complex and changes frequently in the glass showing grassiness, minerality, barnyard, red fruits, spice, earth and toast. The flavors mirror the aromatics. A lighter, elegant style with brisk acidity. 14.4% alc., $35. Landmark is better known for its excellent Chardonnays, but they have been making this fine Pinot Noir for several years. Sourced from several Sonoma Coast vineyards including Kanzler, Keller Estate, Gap’s Crown, Flocchini and Armagh. Aged for 10 months in 33% new French oak. The winemaker is Eric Stern. · There is a noticeable oak bent to the aromas and flavors. Primarily cherry driven, this Pinot has a nice cherry kiss on the finish. There is plenty of overall finesse. It was delicious with a Sicilian pizza which tamed the oak tendencies. 13% alc., $9. Imported by Wilson Daniels Ltd, St. Helena, CA. 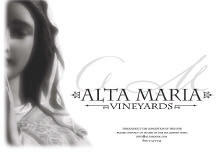 · This wine tends toward the dark side with black cherry and blackberry features throughout. A little earthy and oaky as well. The finish is noticeably tart with significant unresolved and drying tannins. I would put this away for a year or two to allow the tannins to settle down. 13.5% alc., $14. Produced by David Hayman (an Australian winemaker and senior vice president of Pacific Wine Partners) and Dennis Hill (chief winemaker for Blackstone which is part of the Pacific Wine Partners portfolio). Aged 9 months in a mixture of one- and two-year old oak barrels. · This is a light and elegant drinker with pleasing toast and forest floor in the nose and spiced cherries, cranberry and root beer on the palate. A citrus note highlights the tangy finish. Not weighty like many Santa Lucia Highlands Pinot Noirs. A great value and a perfect back-porch wine. 13.7% alc., 3,500 cases, $24. 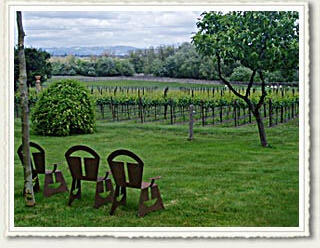 Lafond Winery & Vineyards is one of the Santa Rita Hills oldest wineries, established in 1972. The winery and tasting room is quite picturesque. · The aromas start out with barnyard and hay changing with time to a more mysterious composition of dark red fruits and anise. Sweet Jolly Rancher fruit dominates with cinnamon and chocolate notes. Elegant in style and readily appealing. 13.6% alc., 125 cases, $26. William Moses crafts his wines from purchased fruit in a century-old subterranean stone cistern , an original feature of his National Historic Landmark Casa Barranca Estate. He insists on organic farming of his grapes. · Terrific aromatics here with vibrant crushed cherries and oak spice. A light core of red cherry fruit is supplemented by herb and woodsy tastes. Good acid spine. The nose trumps the flavors but still a decent drink. 14.3% alc., $38. I really liked this wine upon release but this revisit was not as special (oh, the vagaries of Pinot Noir). · Cherry and cranberry perfume leading to cherry flavors enhanced by deft oak. A decent wine which is well-made, but I can’t go ga-ga over it. 14.3% alc., $39. Peter Cargasacchi represents the fifth generation of his family in California, but the first born in the New World. Peter Angelo Cargasacchi and wife Julia Manucla Cargasacchi farm two vineyards, Cargasacchi (Sta. Rita Hills) and Jalama (Santa Barbara). · Toasty oak aromas coat some lovely red cherry and cassis fruit. Oak and herbs carry through to the finish. Silky textured and light on its feet with lively acidity and fine-grained tannins on the finish. 14.5% alc., $60. Michael Verlander and Kerry Murphy work with winemaker Andy Smith to produce a line of stellar Pinot Noirs and Chardonnays. The fruit comes from top-notch vineyards in the Russian River Valley including Widdoes, Dutton, Morrelli, Sundawg Ridge, and Slusser. · An initially floral nose evolves to one of syrupy dark cherries and toast. Very pleasing focused dark cherry and berry flavors with a hint of fennel. Long on the palate, it possesses a full mouth feel and creamy texture. This wine will attract a lot of fans. 14.8%, $85. The inaugural release from this estate vineyard by well-known winemaker Paul Hobbs. · Deep indigo in color. A brooding nose needs plenty of time to open up. Black cherry fruit and toasty oak are evident with coaxing and carry through to the finish which has an earthy bent. A big-boned wine packed with fruit trying to get out. Decant or cellar for a year or two. Keefer Ranch Pinot Noir Keefer Ranch grows Pinot Noir and Chardonnay grapes and is much sought after by winemakers throughout Northern California. It is located in the Green Valley appellation, near the headwaters of Green Valley Creek. Wineries sourcing Keefer Ranch fruit include A.P. Vin, Failla, Freeman, Kosta-Browne, Loring, Pali and Siduri. The inaugural 2006 vintage of Keefer Ranch Pinot Noir will be released in 2008. Sign up for the mailing list at www.keeferranch.com. Oregon’s Top Vineyards According to Wine Press Northwest blog, The Wine Knows, the top vineyards in Oregon are: (1) Shea Vineyards, (2) Del Rio Vineyards, (3) Seven Hills Vineyard, (4) Temperance Hill Vineyard, (5) Meredith Mitchell Vineyard, (6) Seven Springs Vineyard, (7) Goldschmidt Vineyard, (8) Elton Vineyard, (9) The Pines Vineyard, and (10) Guadalupe Vineyard. Sanford & Benedict Vineyard Sold Terlato Wine Group has purchased the Sanford & Benedict Vineyard in Santa Rita Hills from Robert and Janice Atkin. It is contiguous to Sanford Winery’s 110-acre La Rinconada Vineyard. Currently the vineyard is planted to 66 acres of Pinot Noir, 51 acres of Chardonnay and smaller amounts of Viognier and Pinot Gris. The new owners plan to continue to supply wineries such as Sanford, Au Bon Climat, Longoria and Bonaccorsi. Vinquire A new free comprehensive wine search engine has been launched at www.vinquire.com. Users can search for wines at over 3,300 wineries and retailers in the United States. The search engine displays the results of a wine search by prices from lowest to highest. Users can read and submit wine reviews and participate in a forum. Wine recommendations can be optionally limited to wines available at common chain stairs like BevMo, Albertsons and Trader Joe’s. I tried the search engine for several Pinot Noir wine searches and found it very user friendly. Oregon Wine Label Regulations Updated The Oregon Liquor Control Commission updated the 30-year-old statewide wine labeling regulations. Of 72 wine grape varieties grown in Oregon, 18 will now be allowed to be blended with up to 25% of other grape varieties. The remaining 54, which make up more than 90% of Oregon wine production and includes Pinot Noir, will still require a minimum 90%. A wine may now contain 95% of fruit from a place specified on the label (previously 100%) and still carry the geographic designation on the label (ie appellations). Producers can now use either Pinot Gris or Pinot Grigio on Oregon wine labels (previously only Pinot Gris was allowed). 2008 Burgundy Wine Institute Courses The listing of courses available for 2008 in Burgundy given by the Burgundy Wine Institute in Beaune is now available at www.burgundywineinstitute.com. The small-group tasting-based courses are given to both amateurs and professionals in weekend, halfweek and week formats. The courses include field trips to some of Burgundy’s most notable producers, sommeliers and coopers. Courses are sponsored by Elden Wine and BIVB Ecole des Vins. Prestigious Titles MW or Master of Wine has been conferred on only 257 individuals in the world by the Institute of Masters of Wine. 19 nationalities are represented by 21 countries. The title is held by members of the wine trade, producers and connoisseurs. MS or Master Sommelier is a title held by 146 members of the Court of Master Sommeliers. 3 MSs are also MWs - all male. Rendezvous Inn & Restaurant This restaurant in Fort Bragg, California on the Mendocino Coast received the highest rating for food (27/30) in Mendocino County in the 2008 Zagat Survey of San Francisco Bay Area Restaurants. This is the third year in a row the Rendezvous has received this distinction. I have dined once in this turn-of-the-century Craftsman-style B&B and can vouch for the excellence of this restaurant. Worth a side trip if you are in Northern California. Natalie MacLean Assists Thanksgiving Wine Choices This time of year everyone is offering advice about choosing wines for the Thanksgiving table because the choices are complex with so many flavors to match. Natalie MacLean, author of Red, White and Drunk All Over: A Wine-Soaked Journey from Grape to Glass, offers wine and food pairing recommendations in her book not only for Thanksgiving but also foods such as vegetables and chocolate that are difficult to match with wine. Natalie’s free online matching tool at www.nataliemaclean.com/matcher complements her in-depth discussion in the book by allowing you to click on “turkey holiday dinner” to find wines that accompany all kinds of dishes, from roast turkey to turducken, from creamed corn to pecan pie. You can also e-mail her via the website and she will suggest a match for you. My personal recommendation for a versatile Thanksgiving wine (beyond Pinot Noir of course) - Sparkling Shiraz from Australia. Tao Las Vegas According to Food Arts (November 2007), Tao Las Vegas is the single highestgrossing restaurant in the country (and very likely in the world). Last year the restaurant took in $55 million. 50% of the earnings at Tao are derived from alcoholic beverages! The number two restaurant was Tavern on the Green in New York City, taking in $38 million. Auteur for the Common Man Auteur is one of the newer cult Pinot Noirs produced in California. Winemaker and owner, Kenneth Juhasz (who also makes the wine at The Donum Estate), learned his winemaking in the cool climates of Oregon’s Willamette Valley, Sonoma’s Russian River Valley and Carneros regions, and New Zealand’s Central Otago. The name Auteur is French for author and composer. The Auteur Shea Vineyard Pinot Noir (313 cases) has been drawing considerable attention but has limited availability through a mailing list at www.auteurwines.com and Vinfolio in San Francisco. There is also an excellent Auteur Hyland Vineyard Pinot Noir (291 cases). An entry level wine is also available (I call it the common man’s Auteur) which is much less expensive - Auteur Ophelia. It is composed of California and Oregon Pinot Noir fruit ($38) and is available in the retail marketplace. Which Varietal Do You Resemble? At www.vintagesentiments.com, you can take a quick test to determine which wine varietal you most resemble (not the same as the varietal you like the most). Kelly, who runs the site, has also published a book which expands this idea further: Wine Types: Discover Your Inner Grape ($10.95). I took the test and found I was most like (don’t tell anyone) Cabernet! Traditional, dependable, preferring a strong foundation and a realist who trust past experiences. Prodigal Wines Now Available Prodigal Wines in the Santa Rita Hills is now a bonded winery and can market and sell their wines. The wines will be produced at a new shared facility on Santa Rosa Road. I tasted the first releases this year with owners Steve & Mary Russell and can heartily recommend them (see my notes, PinotFile, Volume 6, Issue 18). The website is www.prodigalwines.com. Ridgeway Launches Website Ridgeway Vineyards’ owners Michael and Teela Ridgeway, have launched their website, www.ridgewayfamilyvineyards.com. The new winemaker here is Don Baumhefner, formerly of Copeland Creek. The 2005 Ridgeway Pinot Noir, produced from the estate vineyard in the Petaluma hills, was released in September. At times I have been faced with a Pinot Noir that has too much unpleasant astringency from tannins. I have experimented and found that if I take a bite of non-aged, mild cheddar cheese and then sip the wine, the wine becomes miraculously transformed into a thing of silk and satin with no troubling drying effect in the mouth. After a little research, I found a good explanation for this. In The World of fine Wine (Issue 16, 2007), authors Bronwen Bromberger and Francis Percival discussed the challenge of successful wine and cheese pairing. They pointed out research from the University of California Davis that revealed that consuming cheese with wine (when drunk in isolation) can reduce the taster’s appreciation of certain aromas like mushroom, oak, mint and vegetation and decrease the perception of berry and oak flavors. The cheese also can decrease perception of astringency of a wine because the proteins in the cheese bind the tannins in the wine and the cheese coats the taster’s mouth with fat. So although cheese often blunts the aromatic and flavor profile of a wine, it may reduce the astringent effect of a red wine. The downside to sampling cheese with tannic red wine is that the aromas and flavors of the wine are “dumbed,” and the enjoyment received from them is lost. The results of blind tastings are always fascinating. In this case, the most expensive wine (Felton Road) actually finished last surprising everyone.